How many times have I heard “they must not have had enough faith to be healed”? How many times have I heard “it makes me angry when people say so and so didn’t have enough faith to be healed”? When I read this story, I see desperation, I see faith, and I see a hunger that can’t be quenched by anything other than the touch of Jesus! Jesus healed this man and forgave him of his sins because of His faith. His Faith in what, though? His faith that Jesus would heal him or simply His faith in Jesus? I see a faith in this scripture that says Jesus is all powerful and mighty and is who he says he is! I see a faith here that says, I just want to be close to Jesus and I don’t care what it takes! I’ll give up everything, I’ll dig through clay, I’ll climb my way through and nothing’s going to stop me because I KNOW He is the great I am, He is the son of God, He is my savior. Do you have that kind of faith? Jesus calls that the faith of a mustard seed. But, can faith really ever be measured? Is there a possibility that we can truly not have enough faith? I look at my own life and my worries. For instance, would I have faith like Daniel did in the lion’s den, if I were in a cage full of poisonous snakes? Would I? Would I believe God to shut their mouths and protect me? If I were dying, would I worry about who was going to end up caring for my children and being a mother to them or would I trust God to put the right woman in their paths to nurture them? After all, they are His, not mine and oh, how hard it is to say those words! I think of the Duggar family who, when they lost their last baby, Jubilee, the first words out of their mouths when the doctor came in and said “there is no heartbeat”, were “the Lord giveth and the Lord taketh away. Blessed be the name if the Lord”! Would I say that if that happened to me? Then I think about the atheist. They have no faith! God says in his Word that there is an inner knowledge of God in every man. Some call it “a higher being”, but the atheist has convinced himself there is no God and we are all here accidentally. This person spends their whole life fighting and running away from a God who they swear they don’t believe in and doesn’t even exist. Perhaps faith can be measured. One thing I have noticed in the Word is that Jesus didn’t come in contact with anybody He didn’t heal if they asked! 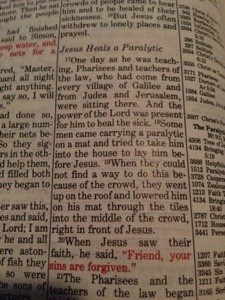 All they had to do was ask and He healed them and they followed Him! I think that’s pretty simple! We ask, He answers. We believe, we know, we follow. Are you hungry for the Lord? Am I hungry for the Lord? What do we do in our lives that would show the Lord we are desperate to be near Him? Do we believe He is who He says He is? Do we KNOW this to be truth? Do we follow Him? Be desperate for Jesus this week!